Revealing mistake: When Lestat returns from the swamp and attacks Louis and Claudia, he advances towards Claudia around the piano and his shirt flies up, showing normal flesh color on his back, only his face and hands are covered in makeup. Revealing mistake: After Lestat bites the breast of the whore and she begins to scream, he bites her wrist and you can see the outline of the blood device in the sleeve of her dress. 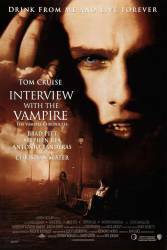 Revealing mistake: When Lestat bites Louis and then drops him in the Mississippi River, Louis is walking back onto land and telephone poles are visible in the background.